The election cycle has reached the stage where there is such a torrent of polls released each day that the flipping leads could give many poll watchers whiplash. 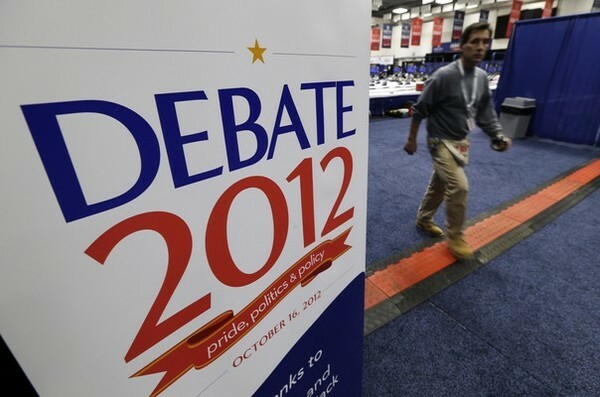 And Tuesday night's presidential debate at Hofstra University could make the race even more volatile. On Monday morning, the RealClearPolitics Average of national polls found President Obama and Mitt Romney tied at 47.3 percent apiece; by the afternoon, Romney had ticked up a tenth of a point. And that’s after Romney had wrested the lead from Obama last Tuesday for the first time in more than a year. But the real movement has been in the battleground states. RCP currently counts 11 such battlegrounds (amounting to 146 electoral votes) as true tossups; Obama leads the electoral vote count in the other states, 201-191. Those numbers are significant because at this point in the 2008 election, candidate Barack Obama was leading John McCain in every single one of those battlegrounds, including conservative-leaning North Carolina. In many of them, he was ahead by double digits, whereas his biggest battleground-state lead now is just 4.8 percentage points, according to the RCP Average -- and that is in the usually reliable Democratic state of Pennsylvania. Until the first debate in Denver nearly two weeks ago, the president enjoyed modest leads in the RCP Averages of every swing state with the exception of North Carolina. (Obama was ahead there for a short time in September -- around his nominating convention in Charlotte -- but Romney surpassed him soon after.) The trend lines show that polls in the Tar Heel State are increasingly moving in the Republican nominee’s direction, with Romney now holding an RCP Average lead of 4.7 percentage points. Post-debate, it’s clear that the tectonic plates of the electoral terrain have shifted, including in Florida and Colorado, which now also favor Romney. The Sunshine State is giving the challenger his next-biggest battleground lead after North Carolina at 2.5 percentage points. Obama went ahead in the Florida average on the first day of summer, but Romney took it back six days after the first debate and has led every public poll in the state since. Republicans have been confident about this state throughout the year, and some Democrats have warned that the Obama campaign should scale back its spending there to channel resources elsewhere. The former Massachusetts governor has a razor-thin lead of 0.6 points in Colorado. Four years ago at this point, Obama was leading McCain by nine points there. And this cycle, the president had been enjoying a solid lead in the Centennial State since the beginning of the general election. But on the same day he lost the lead in Florida -- last Tuesday -- he relinquished it in Colorado too. The polls have been close there in the past 10 days, with Romney leading in a few and the president leading in others. Adding those states’ 29 and nine respective electoral votes, as well as North Carolina’s 15, to Romney’s base line of 191 moves him up to 244. Where tonight’s debate could also matter is in Virginia and New Hampshire. Surveys in these states still show the president with a slim lead, but a shrinking one. Obama had been holding a solid lead in the Granite State, despite Romney’s residence there and his courtship of the electorate in the primary. But the president’s support started to dip last Monday. On the morning of the first presidential debate, Oct. 3, Obama was ahead by six points, at 50 percent in the RCP Average to 44 percent for Romney. Now it’s 47.8 percent for the president to 47.3 percent for his challenger.